The Seinfeld episode was based on "SoupMan", Al Yeganeh, and in real life local New Yorkers and tourists used to wait for hours for his crab bisque, jambalaya or mulligatawny soups. (Remind me to post a recipe for mulligatawny soup, it's really good. I made it for the first time while interning at Tavistock Country Club). Mr. Yeganeh founded “Soup Kitchen International”, that was located at Eighth Avenue and 55th Street in New York City in 1984. 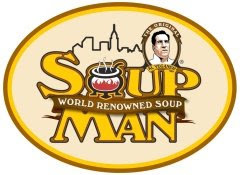 So the "SoupMan" was based on a real man after all. When I took a look at his website, I found the people associated with this heck-of-a-soup cooking guy, are not mean at all. They have supported over the years, a charity dear to my heart, feeding the hungry. The SoupMan franchise has grown to include restaurants and retail locations in NY, NJ, PA, RI, SC, NC, TX, FL, DC and locations throughout the USA . For more information visit www.ORIGINALSOUPMAN.com.